It's my perogative to include non football games in this site and my unhealthy obsession with Balyna games by Toogood & Jones means that this magnificent 1950s baseball game gets its own page. One of a number of different sports games that Balyna advertised in their rules and literature, this is the first set that I have ever seen in the flesh - and mighty fine it is too. 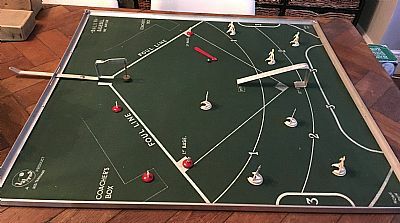 It uses the cricket set players and bowling and battling metal items on a superbly printed pitch. The dimensions also exactly match the other games and so the side walls are interchangeable. Rather frustratingly the middle pages of the instruction booklet are missing, so I have the basics and the parts list but then no idea on how to play the game - help, someone out there must have a complete rulebook???? 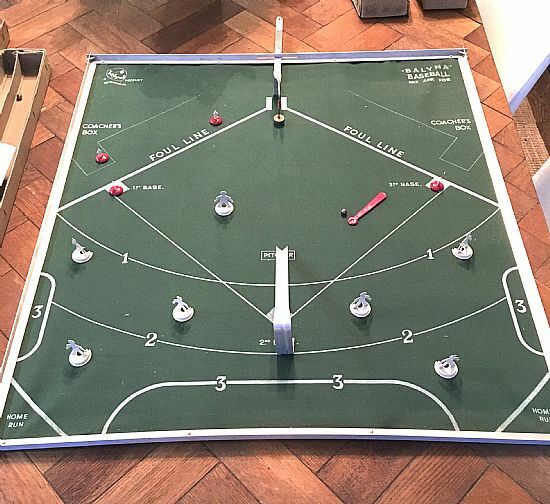 I'd be really keen to hear from anyone who remembers this game or who has a copy of it or any other Balyna game - outdoor games played indoors. The game contained seven large fielders plus four smaller batter team figures. 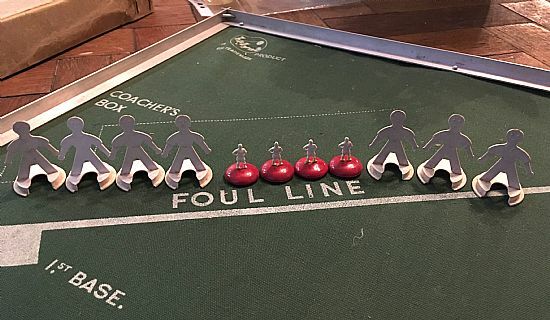 The game looks superb when set up - the red paddle is used to propel the ball towards the runners to try and run them out but that part of the rulebook is missing!